I have two other posts in the works, but if you don't know about Maglula, you will thank me for making this post a priority. The Uplula Speed Loader is honestly, the most fantastic piece of equipment in my range bag. Unlike other speed loaders, Maglula has developed a line of products that are truly brand universal. 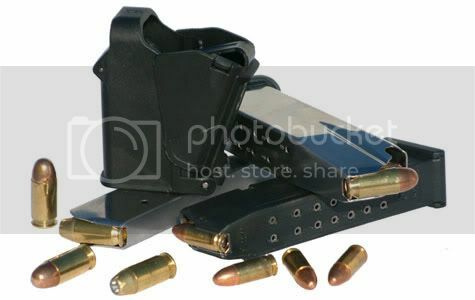 I own the pistol speed loader made for 9mm to .45 caliber ammo. I've shared it with Glock, Sig & S&W M&P friends, not to mention heavy use with my CZ. No one has found a flaw with this Israeli designed & made product. It seems to be made of steel and heavy duty plastic, and it locks closed so that it takes up less space in your range bag. It takes a few focused seconds to master the gesture required by this fantastically simple little device and then you're off. Leaning the base of a magazine on a sturdy flat surface, slide the Uplula over the clip. 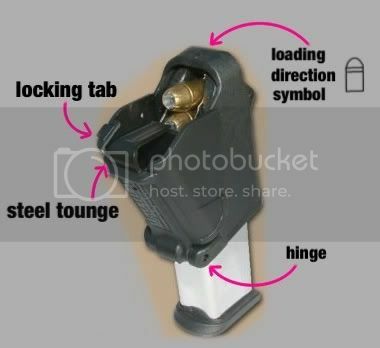 The little bullet symbol on the loader, and the magazine loading direction, should be facing the same way. Then squeeze the Uplula as you press down and slide a round down the steel tounge. A few months ago I took the Uplula to the range for the first time and realized that loading magazines was taking three times as long as shooting the same number of rounds. I agree with instructors who say that you should practice loading magazines by hand in case of an emergency, but at the range Maglula saves my thumbs, my nails & my sanity. One last thing, I would venture to guess that my hands and thumbs are about as strong as the next girls (though I, admit they are larger than the average female's). However, loading rounds 9-13 into my magazines is a real struggle and 14-16 (yes my mags top out at 16) is nearly impossible without the Uplula. Hi Gaby - I couldn't agree more, I LOVE my UpLULA! And now, Guy Tal (the owner of MagLULA) has finally agreed (by gentle persuasion...LOL) to make the UpLULA in PINK! I love that gadget even more, now. I purchased a number of them to pass on in my own business. Hope you find a pink one... : ) I hear they are being sold at a select number of retailers. Again, love this and for the same reasons -- to save my fingers and nails!